GK The Moment - elegant pattern in bright colors from the professional design studio GavickPro. Through the use of proprietary platforms Gavern, this pattern has excellent optimization and fast download speeds. Built-in template manager configuration management allows you to define the look of your website in minutes. Template settings allow you to specify the site background, color and font style, size sidebars and more. 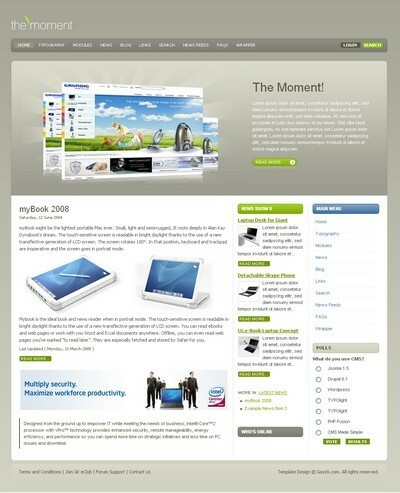 The template has several modular styles, flexible design and layout. Of the main advantages of the template should provide support for mobile platforms, comfortable commenting and SEO - optimization code files.